I’ve been on the Green Smoothie Challenge for 3 days now and so far I am loving it! I am already feeling lots of positive benefits to starting my day with a tasty hit of fruit and greens, my energy has been much higher and I am feeling in better spirits. But smoothies alone are not enough to sustain this bonneted lady; luckily I have discovered the perfect p.m. pick-me-up Raw Energy Bars! 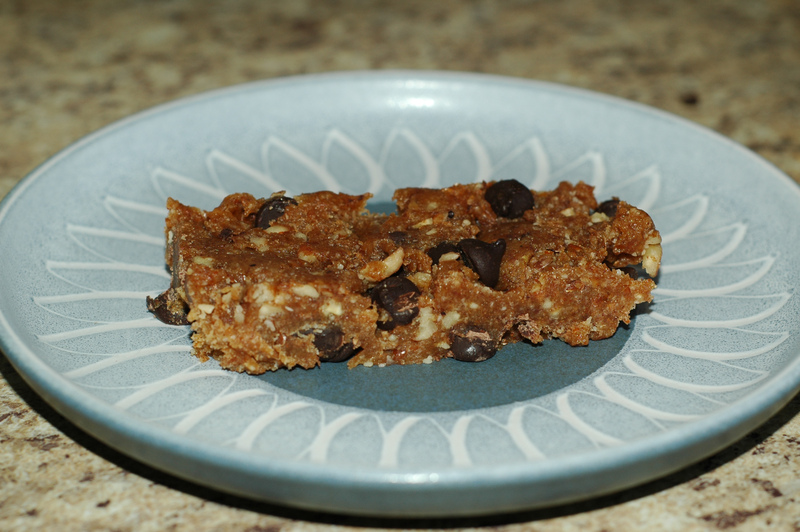 I discovered the recipe on Green and Crunchy under home made Lara Bars (this blog is now inactive so I’ve taken the link down). It caught my attention because our Naturopath recommended those bars for Stephen to keep his energy up in the afternoon. So I thought that I would have a try! I’ve made a few modifications because Susie is making much larger batches and I wanted to start with something smaller in case we weren’t keen. I needn’t have worried! 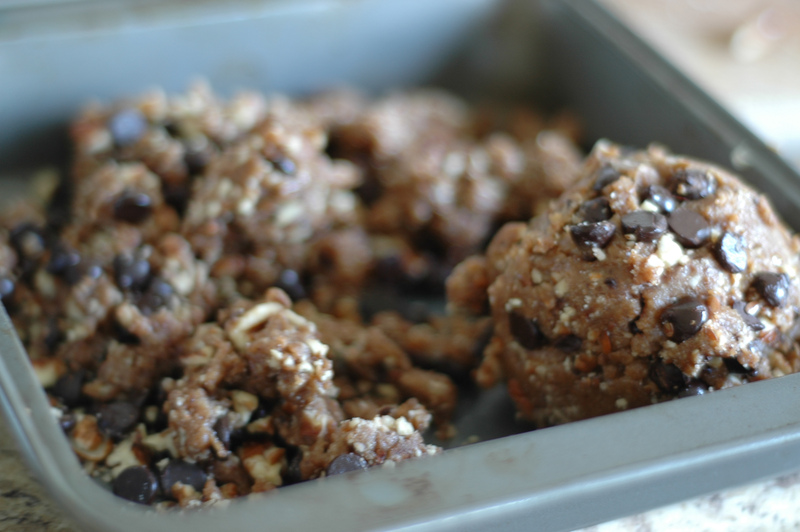 Not only do these bars pack a nutritional punch they are utterly delicious. We’ve enjoyed them immensely over the last couple of days, in fact I’ll be making another batch later to keep up with demand. Here is the modified recipe that I used to make this first batch. Dark Chocolate drops – add to your own taste. These are optional but a very good addition! Shortly after this I began putting them in my mouth and mumbling things like “Oh. My. Goddess.” They really are that good. As I mentioned before they go super well with a fruit smoothie and are the best mid afternoon snack or breakfast as they really do give you that protein boost that will sustain until dinner time. 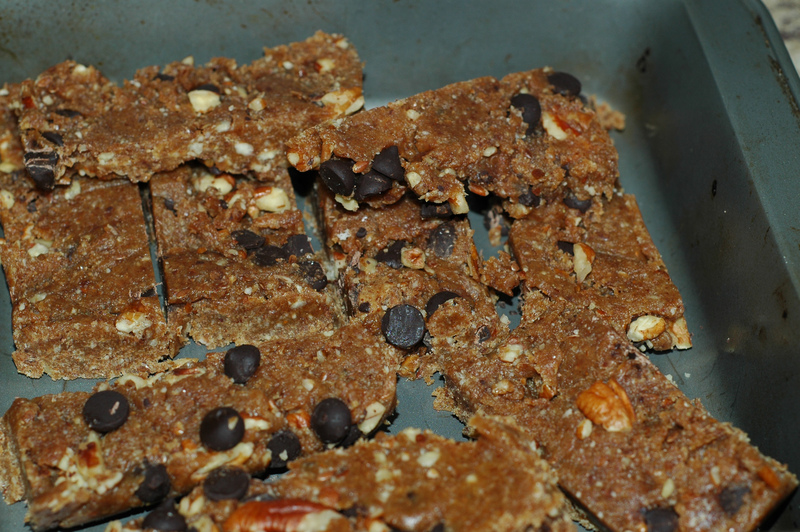 It is well worth checking out Susie’s site Green and Crunchy and her posts on homemade Lara bars as she makes all sorts of suggestions on possible ingredients and how to substitute the nuts (basically use seeds). I am planning on trying her Cashew Cream in the very near future, she recommends it with the energy bars as a super healthy but decadent breakfast. Oh well, if I really must…. Let me know how you get on with the recipe and please do post any links for raw food goodies you recommend! oh these sound much better than the ones i made recently! i’m definitely giving them a try!! thanks for finding the recipe! oh, i have been wanting to do this, but figuring it out seemed like such work for some reason! thanks for the recipe and inspiration! You are so welcome! I’ve had them on my list for a while too but never got round to it, now I can’t seem to stop making them! Let me know how you get on, I hope you are enjoying your smoothies too! These look great. My daughter has milk allergy and cannot eat wheat and I buy the Lara bars sometimes for her. But it would be great to make these instead (and probably cheaper!). Thanks.